We’re back from Disney! Our Memorial Day weekend was amazing. Our trip was full of fun people, fun with our family, and lots of sun. It was Florida in the end of May. HOT. A loved Disney. I know that she won’t remember any of it and that she probably doesn’t remember any of it already, but I got to see my baby girl blow kisses to every little puppet in Its A Small World. That is priceless! 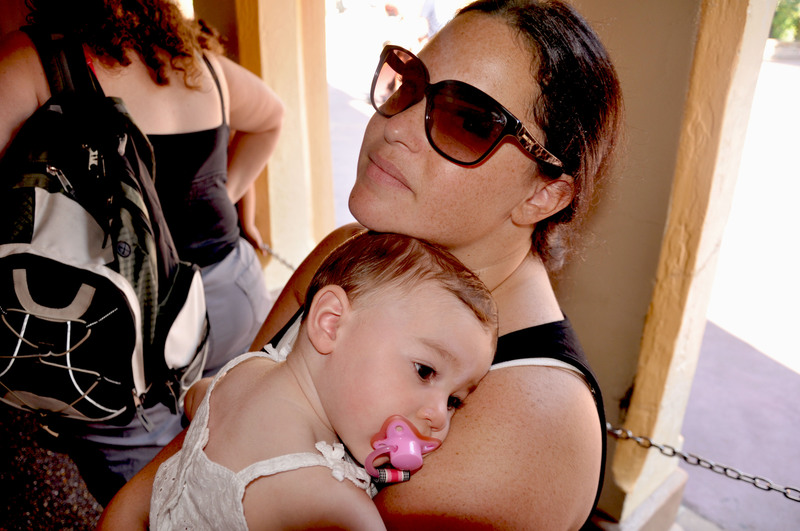 There aren’t too many photos of me and the munchkin or even us as a whole family because we didn’t have anyone to take the pics for us, but here’s one the other LK snapped while we waited on line for the Peter Pan ride! Look at that relaxed girl!!! WHO IS SHE?????? No worries – she’s back to her normal self…all nutty and “spirited” 😉 I’m happy she’s spirited…its better than the alternative of her being a dud! She’s giving me a run for my money, and I am ready to play lady! Sending well wishes to Emily & hoping she is feeling better!